apaiser is proud to announce that the Wallpaper Magazine “Handmade exhibition”, featuring our unique Sampan bath by WOHA, will be part of a once only exhibit running from now in Singapore until 26th August. The Sampan bath, redolent of the water craft that plied the harbour of Singapore for centuries will be one of the feature designs in the exhibition. The event features a distilled collection of 22 one-off wonders from Handmade 2018, Wallpaper magazine’s ambitious annual project dedicated to the marriage of craftsmanship and design. The collection arrives in Singapore, its first and only stop, fresh from its much-lauded debut at the 2018 Milan Design Week, in May this year. The theme for the Wallpaper* Handmade exhibition was Wellness & Wonder, with design talent from all over the world taking visitors on a quest for mental and corporeal wellbeing. apaiser developed the Sampan bath in conjunction with WOHA and using the properties of apaiserMARBLE we were able to meet the objectives of design that adds health and value to your life. If you are in Singapore, make the effort to visit Gillman Barracks and be stimulated by these exciting designs. Bespoke design, custom design…’Bath Couture’! Call it by whatever name you desire, but it just happens to be one of the reasons why so many of the very best interior designers from around the world choose apaiser. Take for example this model for the renowned American design firm, Clodagh. 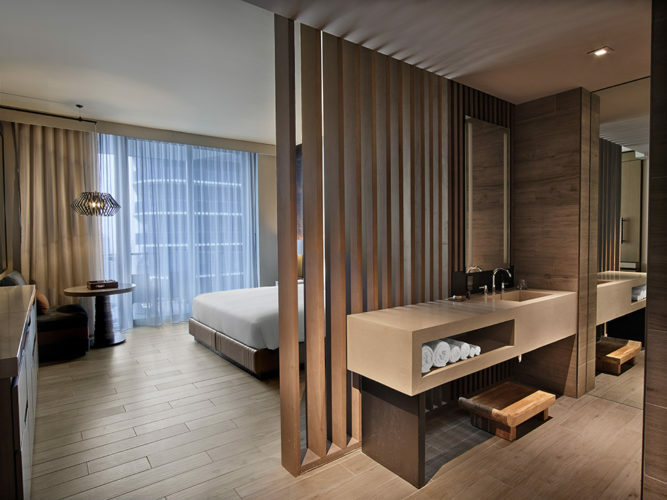 The vanity depicted here was created exclusively for the East Hotel, Miami, recently opened as part of the Brickell City Centre project. The brief called for a very solid, almost monolithic form – one seamless piece incorporating a user friendly open shelf compartment. In keeping with the interior’s aesthetic, the requirements included elegant proportion – the cantilever style bench balanced by a single slim blade mount – honed to a silken smooth touch and finished in a tone of pale buckwheat. The above mentioned Clodagh is actually the Irish born, New York based designer, whose namesake firm is one of the most keenly watched today. 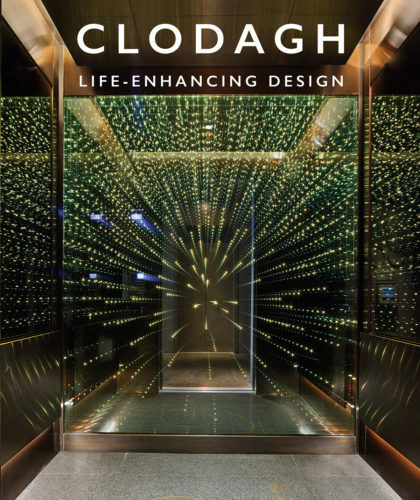 apaiser was delighted to attend the recent launch of her handsome book ‘Life Enhancing Design’ in Downtown New York which bears both her now coveted brand name and the body of work generated by this venerable team under her direction. Entering a Clodagh space is said to be an experience of both serenity and indulgence. Believing clutter undermines serenity, and that minimalism should not be self-denying, she balances these principles to achieve a signature style described as ‘life enhancing minimalism’. You can purchase this inspiring book now via Amazon.com. Meanwhile, apaiser is thrilled to be currently at work with Clodagh on the development of a unique design collaboration, soon to form part of the apaiser range. As the saying goes…’watch this space’!